Relatives of the 21 Coptic Christians beheaded by ISIS in the infamous "A Message Signed With Blood to the Nation of the Cross" video are sharing the pain of losing their loved ones, but also their pride in the men's refusal to deny Jesus on the two-year anniversary of their death. International Christian Concern reported that family members of the beheaded Christians are not allowing the pain of their loss to eliminate the pride in how their loved ones stood up to the Islamic radicals, and refused to deny their faith despite the imminent threat of death. One wife said that her husband "kept the faith, and was martyred in the name of Christ. His faith was very strong. I'm proud of him. He has lifted our heads up and honored us and all the Christians." Another family member added: "I'm very happy that my brother is in Heaven with Jesus now. I loved my brother when he was alive on the earth, but now I love him more than before. He was martyred in the name of Jesus Christ." The victims were kidnapped in separate incidents in Libya throughout December 2014 and January 2015, with IS releasing the video of their execution on Feb. 15, 2015. 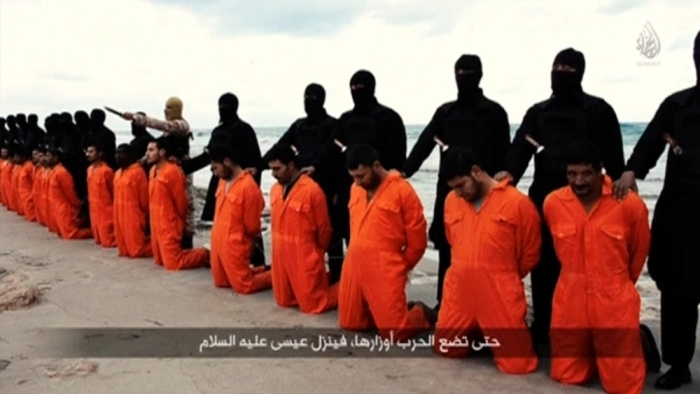 The video shows the Christian men in orange jumpsuits kneeling on the sand as IS radicals stood behind them, ready to carry out the executions at a beach near Tripoli. The massacre shocked the Christian world, and remains one of the prime examples of IS' ongoing brutality and genocide against Christians and other minorities in Iraq and Syria. Bishop Amba Angaelos, general bishop of the Coptic Orthodox Church, said at a service last year that one "profound gift" of the tragedy is that it brought people together. "These men paid the ultimate price, but gave us a cause to advocate for all those persecuted; they also showed us that there was a level of evil that we must all stand in solidarity against, and a level of courage, faithfulness and defiance that we must all aspire to," Angelos said about the Copts. ICC's Regional Manager, William Stark, also commented on the family members' strong faith. "We mourn both the deaths of these 21 Christian men and the brutality behind their execution. ISIS and other extremist groups like them continue to target, torture, and kill Christian men and women who dare to stand up for their faith," Stark said. "This anniversary, however, demonstrates the faith of the surviving family members. Their patience, hope, and love continue to stand as an example for the global Church," he added. The 21 Copts are being remembered as the "martyrs of Libya," because they were killed specifically for their Christian faith. Last year they were officially registered in the book of martyrs by Coptic Orthodox Patriarch Tawadros II.